Well with challenge for this week is favourite colours and at the moment it is red and gold. For the face and hair I used my spectrum noir pens and used red and gold glitter. This is lovely! So clean and neat (I can't do that!) and a fab image. This is fabulous, I love the image and red and gold sure look great together. 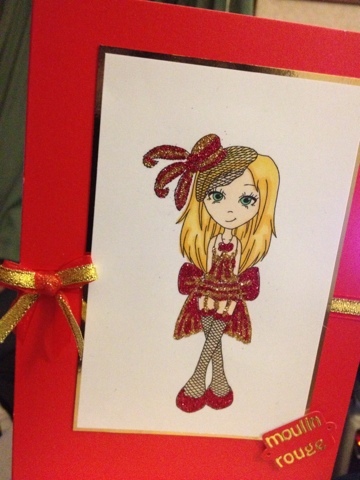 Red and gold is a fantastic color combination, it contributes to give your card such an elegant look, and it's perfect for the showbiz theme you've chosen for this card!